Tsuneishi Shipbuilding Co., Ltd. finished building an 82,000-mt D/W type bulk carrier Ultra Lion on January 7, 2015, marking the completion of the builder’s 200th Kamsarmax model vessel. 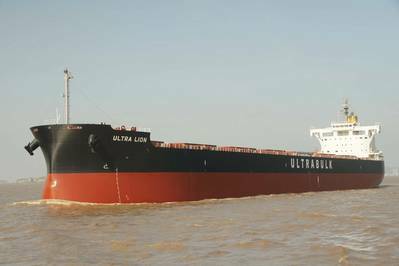 Built by Tsuneishi Group Shipbuilding, Inc. at Zhoushan City in the Zhejiang Province of China, the Ultra Lionwill be delivered to buyer KambaraKisen Co., Ltd. The first Kamsarmax bulk carrier was completed in February of 2005. After 9 years, 11 months and 200 ships, the Kamsarmax vessels account for the top share of more than 28% of all the 80,000- to 84,000-mt class bulk carriers that have been built since 2000 around the world, the builder said, adding that quick response to new international rules and improvements in performance quality, such as fuel efficiency, have lent to this ship’s popularity, resulting to more orders being made for this particular model. As of the end of December 2014, the company’s order book reflects a number closely approaching 300, making the Kamsarmax Tsuneishi Shipbuilding’s best-selling ship ever. According to the builder, the 82,000-mt D/W Kamsarmax bulk carrier was the international maritime industry’s first ship type to increase the deadweight of Panamax bulk carriers (vessels whose structural dimensions make them capable of traversing the Panama Canal) from the 70,000-mt class to more than 80,000-mt, and is simultaneously responsible for increasing transportation efficiency of vessels. Tsuneishi Shipbuilding noted that it has kept abreast of international rules since the first Kamsarmax design model was fully accomplished in 2002. In joint studies with the research institutes of Hiroshima University and the Monohakobi Technology Institute, data was gathered from tests using large towing tanks and 1/10 scale models to recreate real sea conditions in order to find optimal solutions in improving the vessel’s energy-saving capabilities and propulsion performance. Features like the MT-FAST (to improve propulsion efficiency) and SEAWORTHY (to reduce wave resistance) were introduced in the 2006 improved model of the Kamsarmax. In 2010, the model was further enhanced with a high-efficiency, low-vibration propeller developed with TOP-GR technology which, together with the refined hull shape, boosts propeller propulsion capability, as well as having an engine that complies with the NOx emission reduction regulation (Tier 2). The 2012 Kamsarmax is a ship that made standard the electronically-controlled engine in all subsequent products of Tsuneishi Shipbuilding Co., Ltd., including cost-effective fuel consumption functionality.